First Choice Locksmiths stock many different types of locks suitable for use on gates and fences and offer a service to repair gate locks and adjust strikes due to sagging gates. We can also rekey many different gate locks to match your house key. 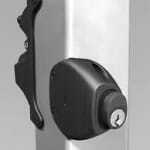 The following are just some of the Gate locks we carry. Call today and speak with one of our qualified consultants.